Mangoes are tropical fruits with fleshy pulp surrounding a huge inner seed. Mango juice or nectar contains a variety of nutrients in a low-calorie package. A 1-cup serving of mango juice has 128 calories, with less than 1 g each of fat, protein and cholesterol. The juice provides 0.8 g of fiber and has 33 g of carbohydrates, with a sugar content of 31 g.
One cup of mango juice has 61 g of potassium, 43 g of calcium, 8 g of magnesium, 5 g of phosphorus, 0.9 g of iron and 1.0 mcg of selenium. It contains trace amounts of other essential minerals. With 13 g of sodium, mango juice is a low-sodium beverage. A whole mango provides more fiber than juice. 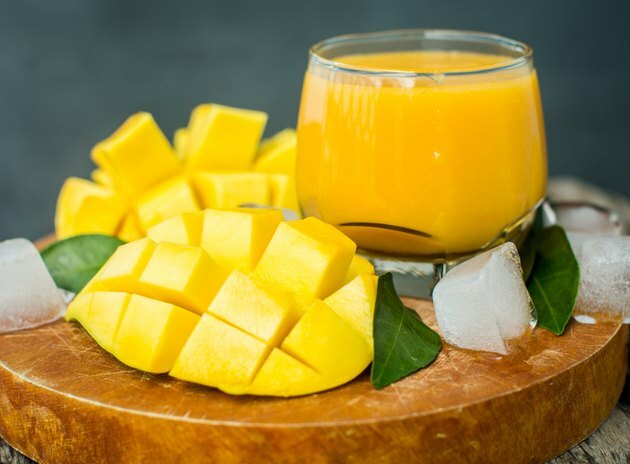 A 1/2-cup serving of mango chunks has 1.5 g of fiber, while a serving of juice has 0.8 g. The fiber in a whole mango helps you feel full longer and keeps your blood glucose levels stable. Are Mangoes Good for Dieting?